The review box wasn't the pretty blue, but it still had their logo! 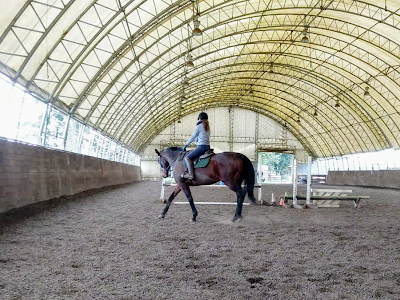 SaddleBox is awesome for several reasons, the primary one being that it is built for equestrians. 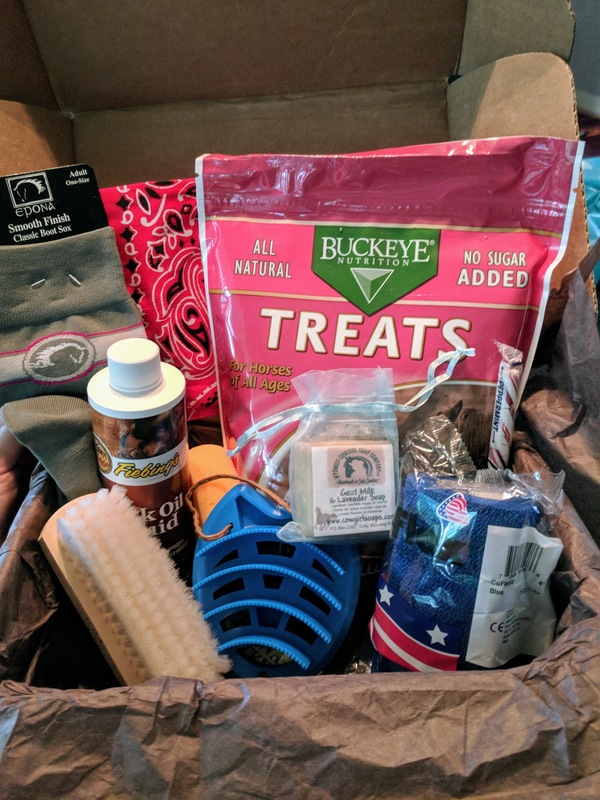 Their boxes include a variety of things, such as horse treats, grooming tools, tack stuff, and gifts for the rider, such as apparel and training books. Their boxes are filled with general equestrian stuff, rather than being geared towards a specific equestrian discipline. This is a good thing for the company because they are able to have a much broader audience. I do think that a potential expansion idea for the company could be boxes geared towards specific disciplines, or even just a discipline-specific add-on to their general box. I personally love all horse stuff but get especially excited about hunter/jumper stuff. Another great quality of SaddleBox is that it is actually decently priced. 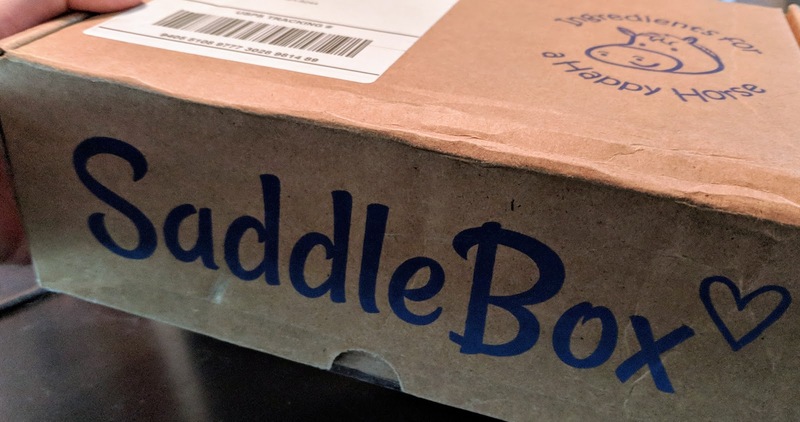 A regular monthly subscription to SaddleBox costs $34.95, and shipping is always free. When you buy a new subscription, they send the first box right away (I got mine in three days, so they're obviously paying for faster shipping). After that, every box will be sent on the 15th of the month. To me, the price is fair & reasonable. Especially when I think about the fact that every time I got to my local farm store I walk out spending at least $50, this is a justifiable price to me. They even will sweeten the deal by giving you 20% off on your first box (just enter your e-mail on their website). I will evaluate the actual value of the box further in the review, but spoiler alert, this box definitely has great value. All subscription boxes share the common appeal of excitement and fun. Getting a package in the mail is always fun, but especially when you don't know what is inside, it takes on a present-like quality. I was super excited to see what goodies I would get. And since you have no idea what is inside, you'll always be happy with what you receive! It's impossible to be disappointed because you don't have set expectations about what you will get. 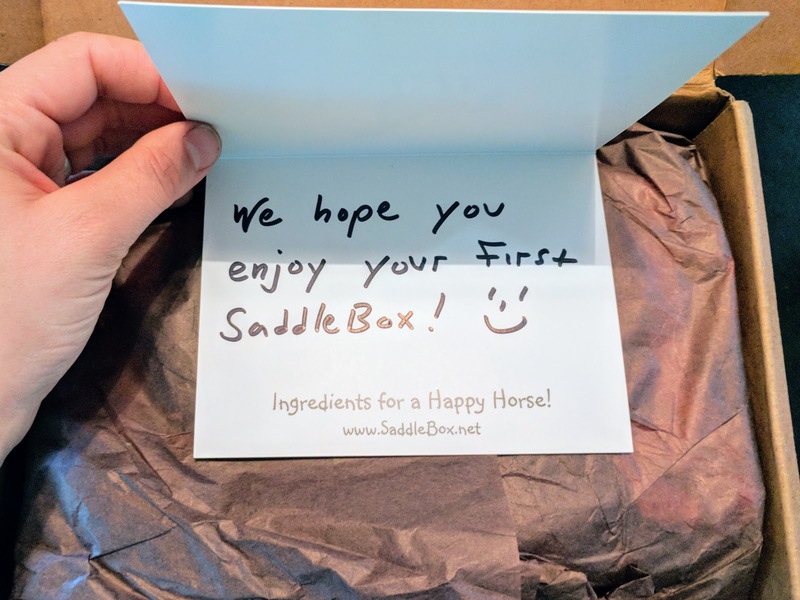 Not only is purchasing a subscription exciting for the box receiver, but SaddleBox also partners with horse adoption organizers like The Right Horse Initiative. This is awesome, because some of their proceeds are going to such a good cause. It's a company that you can feel good about buying from. To me, the biggest appeal of SaddleBox is the ability to get cool products that I wouldn't be exposed to otherwise. I live in an area that is not very "horsey" at all. We don't have a tack store or any sort of equestrian-specific shopping option. We have a few farm stores that have some horse stuff and that's about as good as it gets unless I'm willing to drive the two hours to get to a bigger city. 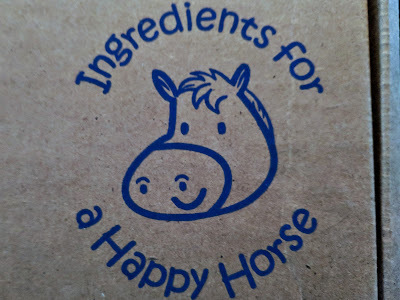 Because of where I live, my selection of horse products is very limited and boring. Almost every single product that I received in my SaddleBox was something that I've never seen before, which is awesome! Mini Review: Casey HATES peppermint everything. I've never successfully gotten her to eat peppermint treats before... Until these. For some reason, my peppermint-hating horse LOVES these treats. 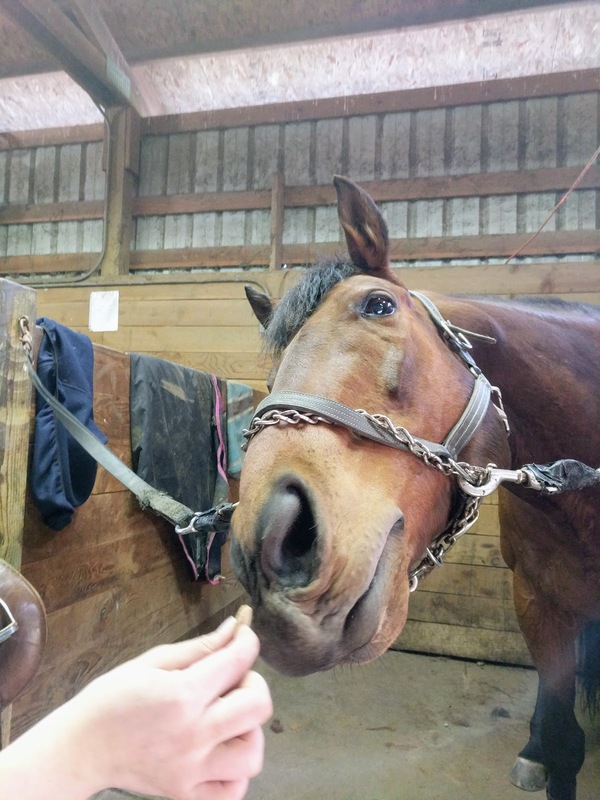 Not only does my picky mare love them, but every horse I gave them to, liked them (5/5 horses approve). Best of all they are low in sugar and so I don't have to feel bad about giving her a ton. I really like the small size of these treats (quarter-sized), because they are perfect for trick training. Mini Review: This may be one of the best shedding tools that I've seen. It has four rows of hard plastic "blades" and so is great at catching the hair. I'm sure that if Casey had dried mud on her, it would be equally good for that. That being said... although I love it and think it's perfect for the job, my thin-skinned Thoroughbred HATED this with a burning passion. Like, she would dramatically drop her back when I even made slight contact with it. Epona Lucky Groomer. The amount of hair might not seem like a lot, but I tested this out AFTER my normal grooming routine. Mini Review: These are simple boot socks. Just plain grey with the company logo. Quiet and unassuming. They are the perfect thickness in that they disappeared underneath my boot and I couldn't feel them at all, but they are thick enough that I'm not likely to rip the fabric when I do stupid stuff like accidentally zip up part of my sock. 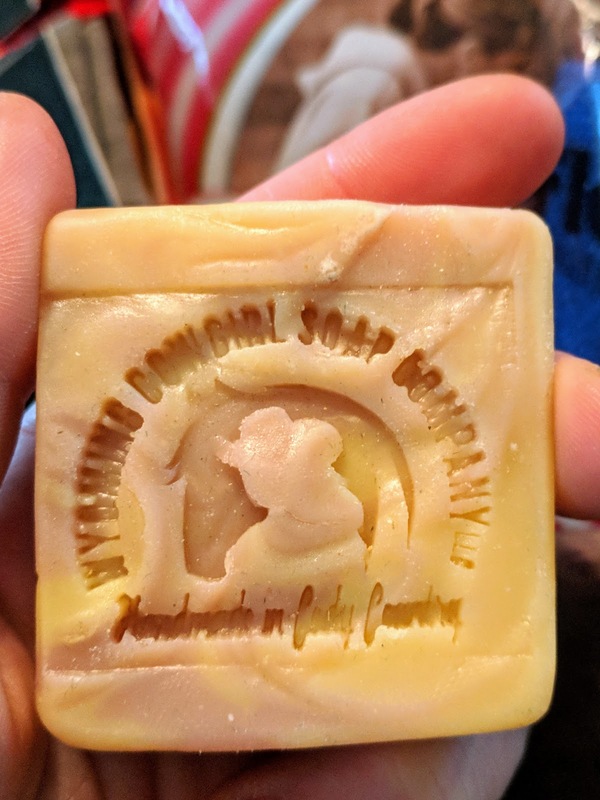 Mini Review: A perfect little soap, with an adorable icon of a girl & a horse on it. It smells nicely of lavender, but is not overpowering. 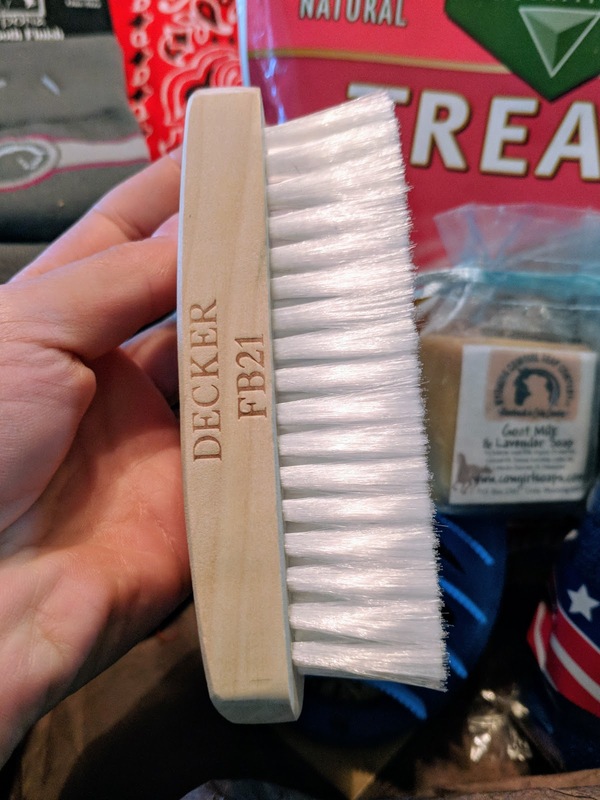 Mini Review: I don't actually own a face brush. Up to this point, I've made do with my regular body soft brushes, so it was really nice to get this! It's very soft & so Casey approves. Mini Review: It's vet wrap. What's more to say? A handy thing to have in a tack trunk in case of emergency. 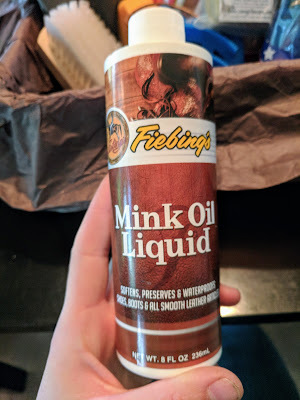 Mini Review: I feel conflicted about this product, because of what I've heard about Mink Oil. From what I've heard, Mink Oil is more of an old-school leather conditioning product. It's supposed to make leather very soft & waterproof, and also has leather-darkening qualities. I'm hesitant to use it though, because I've heard that over time the oil will actually break down the leather & the stitching on the leather and so it can weaken tack over time. I think that I'll keep this product specifically for its leather darkening qualities, however, will not be using it as a tack cleaning staple. Mini Review: It's a tack sponge. Meant to clean tack. 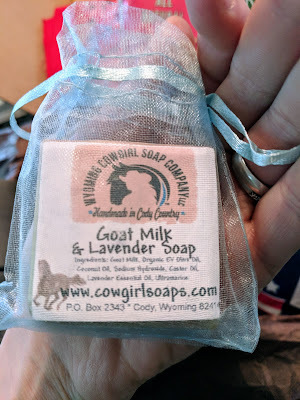 I appreciate that SaddleBox included it along with the Mink Oil though so that you could use the product right away. Mini Review: This is more of a Western thing, so personally it's not my jam. But Casey looked cute in it! Casey wore the red bandana. Now it'll probably go to one of the dogs. Mini Review: Casey hated this. Because it's peppermint. I loved it though and so ate it myself. And so the total value of the SaddleBox I received was about $50*. If you consider that most of these products would have to be ordered online (at least where I live), and thus you would have to pay for shipping, the value would be even greater. So all in all, you are getting a good deal when you buy a SaddleBox. *Note: Some of these items I could find for cheaper online as a sale price, however, I feel looking at the item's original price is more accurate to determine the value of the SaddleBox. Overall I was really happy with the box I received. Some of the things were not as useful or exciting to me as others, but there wasn't anything that I was disappointed in getting. I'll be able to use everything & was super excited about some of the items in particular. Obviously, all boxes will be different, so if you are curious about other things that have been included in boxes to get an idea if this is the right subscription box for you, check out the prior boxes here. 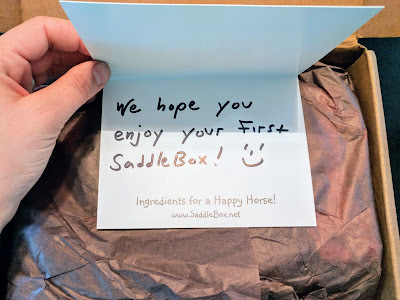 I think that SaddleBox is a great subscription box. For me, it's really awesome to get to see all of these products that I wouldn't get exposed to otherwise. Not only that, but it really is a decent price for horse-related goods. I'd say that if you were curious about SaddleBox, go for it! The Hamster has Fled the Cage! I often joke that Casey has a hamster brain. Specifically, I think of her brain as being a big hamster cage with one of those really cute (but sometimes vicious - anybody else bit often by their pet hamster as a kid?) brown and white spotted hamsters in it. This hamster is mostly a good hamster that loves to funnel its energy by running on the wheel. When the hamster is running on the wheel, Casey is focused, driven, and on-task. However, hamster is not the smartest animal, and so can be very distractable. This shows up in Casey's behavior as well, "oh look at that saddle pad! Let's try to eat it!" Sometimes though, external stimuli is just too much for tiny hamster. Hamster can't handle things like another horse cantering up from behind, or having a dog make a sudden movement, or even watching other horses play in the pasture. And so hamster abandons its cage and flees for the moment. These are the moments when Casey is just beyond any sort of reason, in complete and total meltdown mode. Most often hamster flees the cage when there's something that Casey finds really scary. 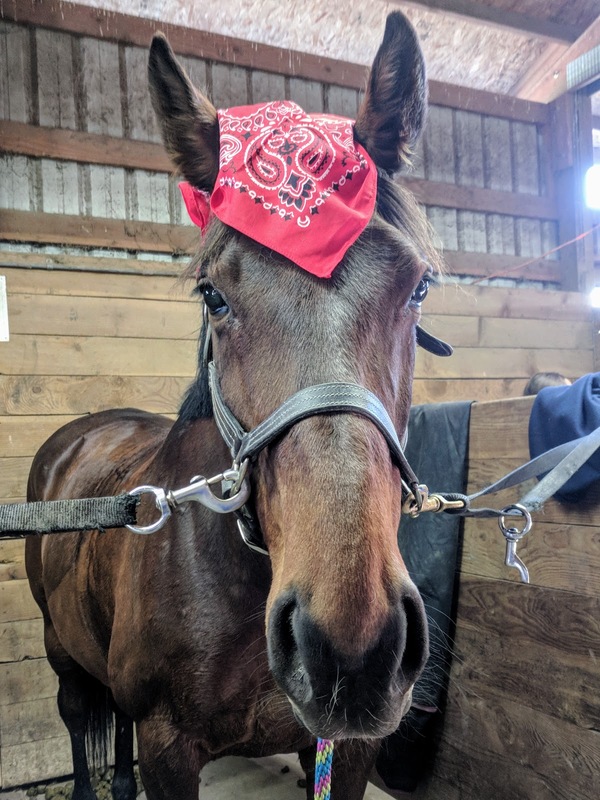 For instance, in yesterday's ride, all was well in the world, it was a gorgeous sunny day, and Casey had been going around like a perfect unicorn. But then... in the midst of a very nice canter set, two horses in the far pasture decided to take off galloping & bucking, which then set off the other ridden horse in the arena, who panicked and took off at a very fast canter, and so Casey's poor little hamster couldn't handle it, threw itself out of the cage, and I was left with a bucking bronco. She took off with flying bucking leaps across the middle of the arena, I yelled at her, then we circled until she finally slowed her speed. Once we finally got a halt, Casey's little hamster sheepishly crawled back into its cage and all was good with the world again. Besides the whole hamster fleeing fiasco, our ride was actually lovely. We were working on trotting some "jumps" (really poles on the ground in between the jump standards). Casey was staying really soft and light in the bridle throughout the whole ride, which is like magic. 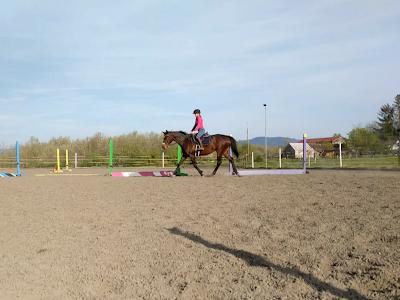 She really was getting into the exercise and so would calmly trot up to the pole, then jump the thing (as if it were actually a 2' jump) and then get a lovely canter away. How big exactly does she think these poles are? 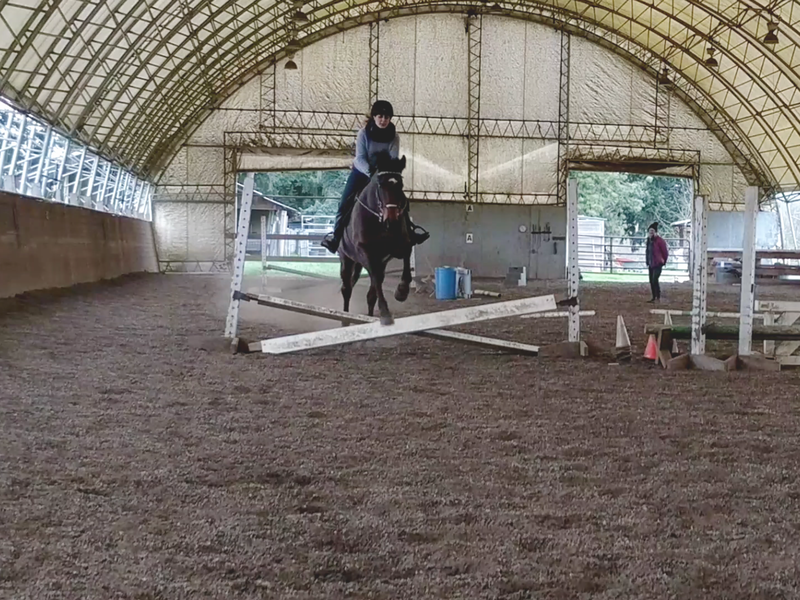 I felt like I was really able to stay with her motion and wasn't jumping ahead (which somehow has reappeared as a bad habit after not jumping for so long). I didn't let her canter any poles, but the canter that we were getting was so calm and uphill that I felt as though we could have cantered a whole course and she would have stayed relaxed. But, hamster brain and all, so instead I opted to stick to just a trot until we were actually practicing "jumping." What do you imagine your horse's brain to be like? Anybody else have a hamster-brained creature? My ultimate dream is to be one of those riders who seem to communicate with their horse by magic. No bridle, no saddle, no whips, just a true union of souls. And so with visions of galloping Casey bridleless through a field, I ordered myself a neck rope! Now, there are lots of neck ropes available. And to be honest, for a while I got by with just a lead rope haphazardly tied into a neck rope-like shape. BUT, I have a true love for pretty things, most especially pretty horse things, and so I knew I wanted a pretty neck rope. After some scouting around on Instagram, I knew exactly which one I wanted. 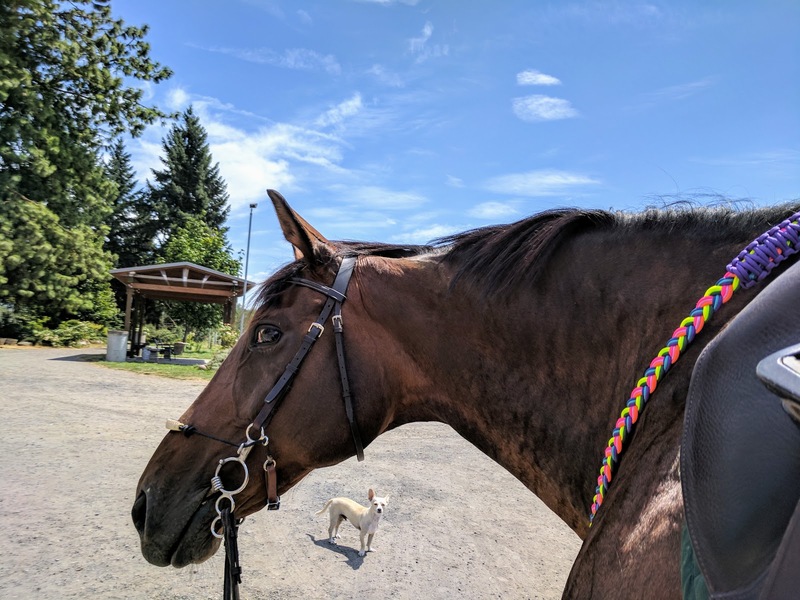 I wanted a beautiful rainbow neck rope made by Reins for Rescues. Reins for Rescues is an awesome company. They make really beautiful things, but they also have a beautiful purpose. It's a family-run rescue group located in Pennsylvania. They rescue dogs, cats, and equines! The profits that they make off of selling their products all go to the care of their rescues. It's super exciting to not only be able to purchase something you need, but to also know that the money you spend will go to such a great cause. Reins for Rescues makes tons of awesome products that are mostly paracord based. They have reins, wither straps, neck ropes, lead ropes, dog leashes, and tons of other cool stuff. Not only do they have a ton of pre-made products, but they also allow you to customize products in your own favorite colors. They have over 400 colors available, so you are sure to find what you want. I am indecisive and so all of the color choices in the customizable neck ropes were overwhelming to me. I instead opted to pick a pre-designed product, since I fell in love with the bright colors. I bought the Kota's Colors Rainbow Neck Rope and it turned out to be just a bright and vibrant in person as it looked online. My neck rope, as well as most of the Reins for Rescues products, is made out of paracord. Now, if you didn't already know this, paracord is pretty magical. Reins for Rescues uses 550 nylon paracord, so their products are super strong, especially since they use multiple strands of paracord. The other benefit of paracord is that it is fade-resistant and so the colors are sure to last for a long time. I've had mine for over half a year at this point and have noticed absolutely no fading. Not only are their products durable, but they are also super affordable. My neck rope only cost me $15, which to me seems like a great deal. In fact, all of their products are similarly affordable. As soon as Casey's current lead rope dies on me, I have my eye on a Reins for Rescue lead rope. Especially if I could get it in unicorn colors for my very own unicorn. Since all of the products are made handmade and custom-ordered, you do have to expect some time for the products to be made, but I still got my product in a reasonable amount of time. I ordered my neck rope on July 17th and it shipped August 2nd. I got it a few days after that. So expect a couple of weeks to receive your custom product. Since receiving my neck rope it has gotten plenty of use. 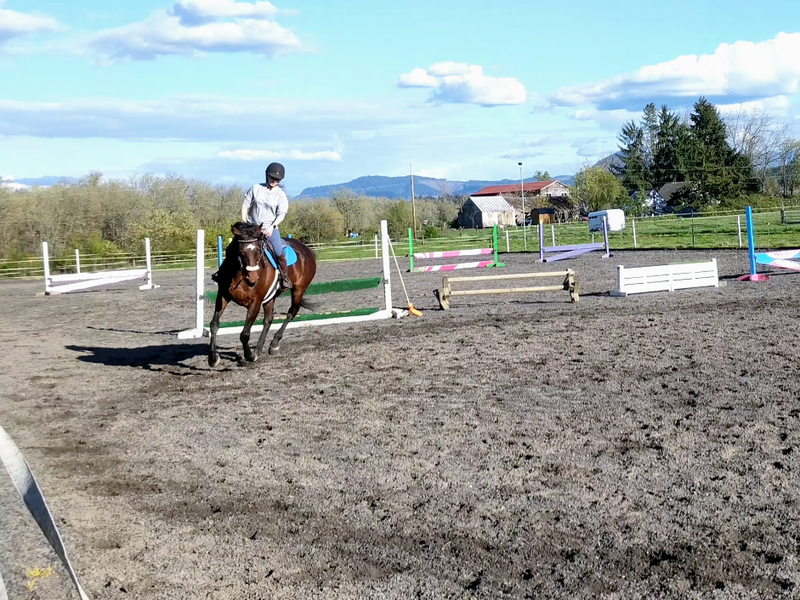 I have been working with Casey towards bridleless riding & she's getting really good at responding to leg and neck rope pressure. I love my neck rope because it is strong enough that I know it won't break on me, it has a handy little "handle" to hold on to, and it is super pretty. Definitely an upgrade from using my lead rope. I've also gotten a lot of use out of my neck rope in my lessons. 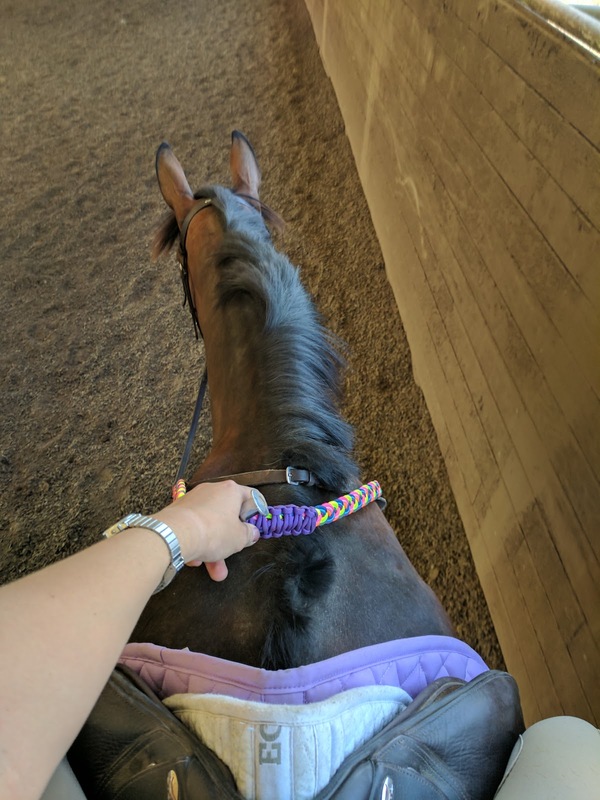 When I have a student who is struggling with balance, I just toss my neck rope on the lesson horse and all of the sudden, the rider is able to feel much more secure in the saddle. One of my lesson students even bought her own Reins for Rescues neck rope after falling in love with mine! It's definitely a handy piece of tack to have around. View from the top featuring the "handle"
Overall, I really do love my neck rope. I think that it was a great purchase. I got something I needed, it's really pretty, and I supported a good cause. I highly recommend that you check their products out! Note: I was not asked to write this review, or was compensated in any way. I just really love this product! "Shape the Clay, Don't Smash It"
After a month of no lessons due to figuring out Casey's back soreness issue, we have finally gotten to resume them! Yesterday was the first lesson back and we went into it not really knowing what we would be working on. I figured that it would be a flat-only lesson seeing as we just started her on the vitamin E supplements at the start of the week. We want her to be on those for at least a couple of weeks before jumping, although it's highly dependent on how she is feeling and moving. 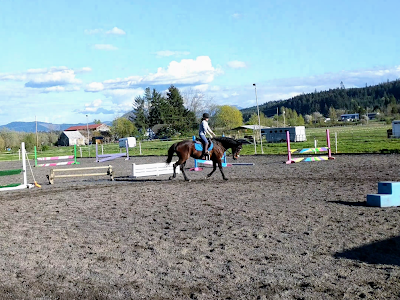 We opted to have our lesson in the outdoor arena because the weather was gorgeous. The downside of this though is that Casey is always a little bit worse in the outdoor arena. 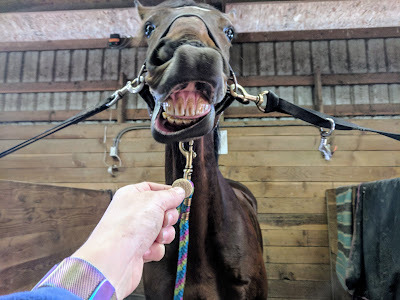 She gets overly excited sometimes and so is just a lot harder to contain and focus there versus the indoor arena. I was a bit worried about how it would go, but aside from some slight jigging at the walk when we started, Casey actually seemed very relaxed! This was a good thing because, as Trainer proclaimed at the start of the lesson, this ride would be about focusing on Casey staying relaxed throughout the entire ride. We started off our lesson with a stretchy walk. After a bit of a warm-up, Trainer immediately kicked our butts into gear. 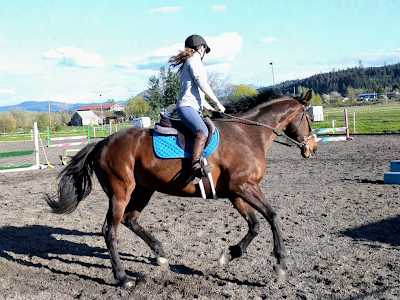 She asked us to get a nice, calm trot. Not only did we need to have a calm & slow trot, she also wanted Casey to be light as a butterfly on the bit and hold a bend. All of these things do not come easily to Miss Mare. She dislikes going slow, she loves to lean on the bit, and she tries to blow through her outside shoulder while bending. That being said, I lucked out in that Casey was in a very agreeable mood and so, while it did take effort on my part, I was able to get all of this out of her. Calm? Check. Bending? Check. Light? Mostly check! All of these things are bits and pieces that we've been working on in our independent, non-lesson rides, so it was a matter of putting all of the pieces in place. In order to get a calm & slow trot, I had to really focus on keeping my posting slow & even (and not use the reins to get her to slow, because then she'll lean on my hands). In order to get Casey to be light in the bridle, I had to play with the reins (slight wiggling) when I noticed that she was trying to lean on them. And in order to get a true bend, I had to give and release the inside rein, while also remembering to keep her bending around my inside leg, and supporting with my outside leg and rein to keep her from blowing through her shoulder. None of these things are complicated exactly. We've been working on all of this stuff for months and months. BUT Casey doesn't like to make any of this easy. The other thing is that I am working on becoming more refined and delicate in how I communicate with her. 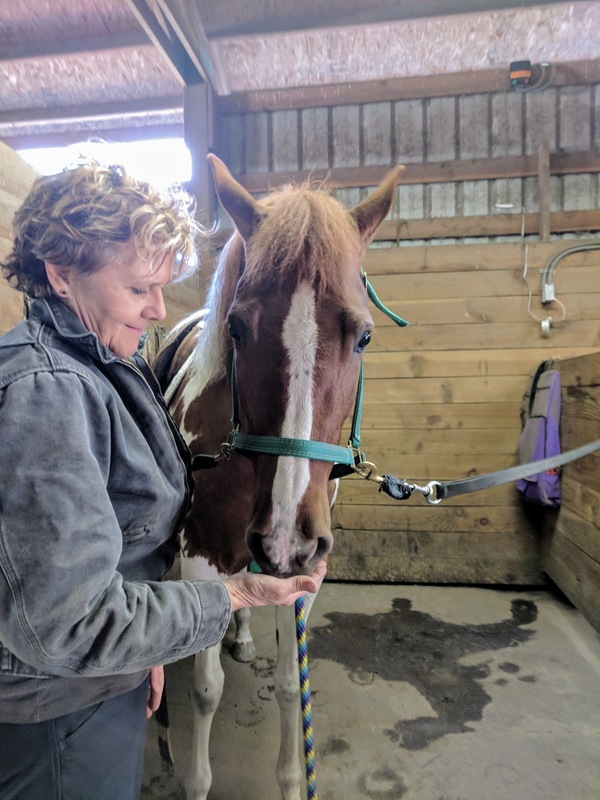 As I get more advanced in my riding, I am able to become more refined in my communication, but it's a learning process and is a hard thing to learn. Why is riding so hard! And so, that's what brings us to the article title. Trainer came up with a new saying to try to help me with the concept of lightness, which is "shape the clay (the horse), don't smash it." 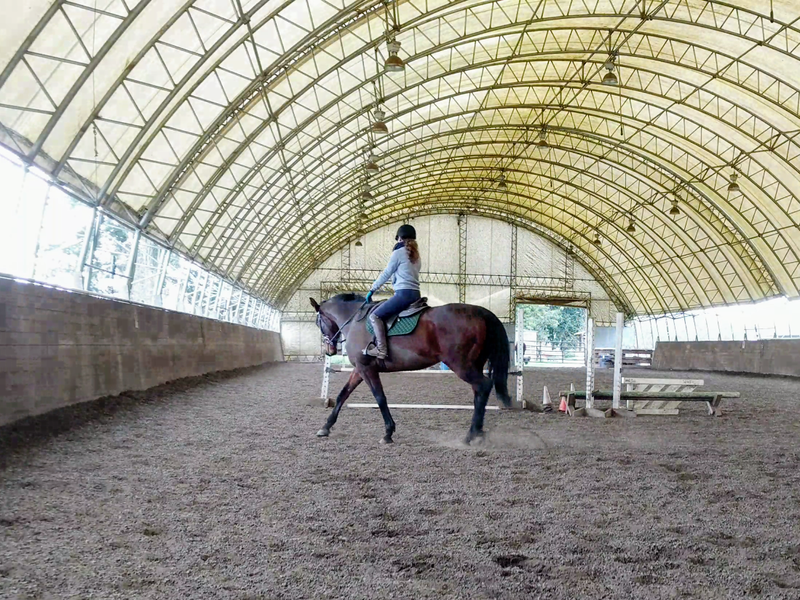 The goal of every ride should be to get the horse to be light and responsive, and in turn, the rider must also be light and responsive. The rider should be able to shape the horse into the movement that they want and then be able to step back and allow the horse to continue without support. 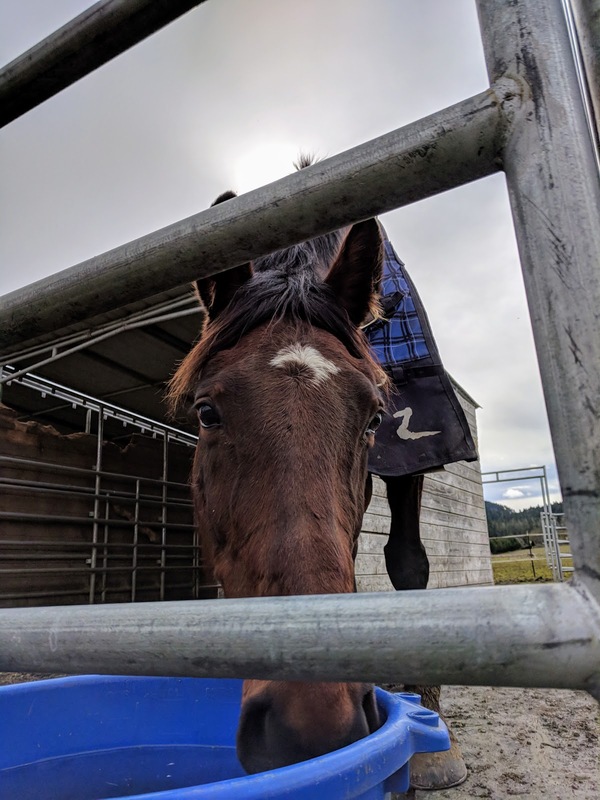 Ideally, Casey will be able to carry the trot we were getting, with the bend, and the slow pace, and the lightness on the bit, with minimal help from me. Trainer had us work on this by having me give Casey all of the reins, see how long she would hold all of the aspects, and then resume normal riding when she fell out of the rhythm. Surprisingly enough, Casey figured this trick out relatively quickly. We went from only being able to get one or two good strides, to getting up the seven or eight by the end of the ride. After doing all this good work at the trot, we decided to test out the canter. We wanted those same qualities that we had in the trot to show up in the canter; the lightness, the bend, and the calm & slow pace. We got really nice upward transitions from Casey and she stayed mostly calm & slow. There were puddles in one corner of the arena that she got a little bit strong through but for the most part, I was able to keep her at a reasonable pace. 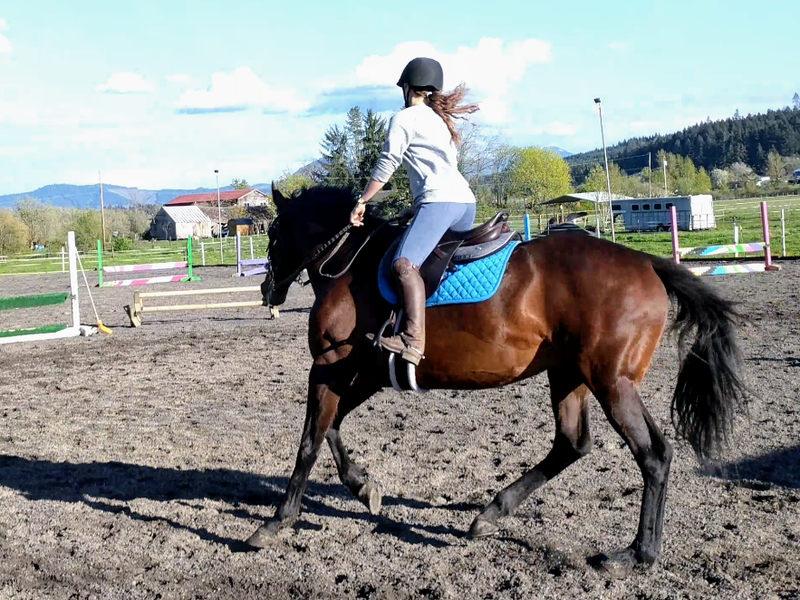 The lightness in the bridle and the bend were definitely harder for us. When we stayed on a twenty-meter circle, I was able to get a nice bend from Casey, and it was significantly easier to keep her light. As soon as we used the whole arena, she would start to try to pull. Trainer emphasized to me that I need to be soft in the hands so that Casey will be soft in the bridle, so I was working hard to keep her from leaning while at the same time staying soft. It's definitely a struggle because she kept trying to throw herself on my hands and then I would have to give-take-give to get her back off of them. We also spent some time working on downward transitions. 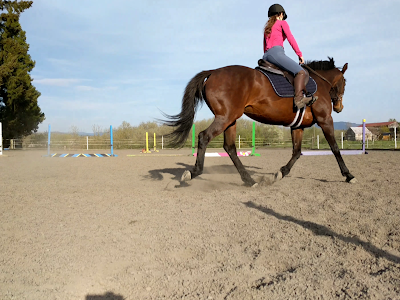 Casey loves to just ka-plunk her way into the trot, so Trainer had me really exaggerate the bend in the transition, which resulted in a much nicer one. Trainer and I opted to end our ride at the half-hour mark, rather than a full lesson. Casey had been so good throughout the whole lesson, and the things that we were asking her for was some complicated stuff. I definitely had a lot of good takeaways. I can feel that Casey and I have made so much progress in terms of how we communicate with each other and the type of movement that we can achieve. 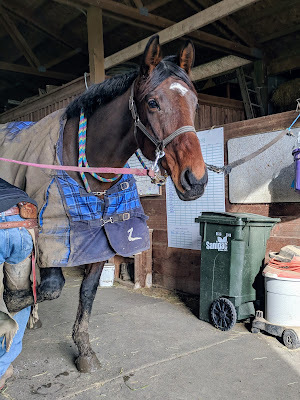 I was talking to one of my barn friends post-lesson and she observed that Casey has come such a long way from the giraffe-bulldozer hybrid movement that she had when I first started working with her. At this point, my horse is almost fancy! My homework for the next week is to continue to work on lightness and bend in my rides and I'm super excited for our next lesson! The past month has been possibly the most hectic that my life has ever been as an adult. In terms of horse world, Casey and I have experienced a roller-coaster of experiences. Shortly after my last post (early March), Casey went lame. And it was THAT leg... ya' know, the cursed one that had the suspensory ligament tear. I, naturally, went into helicopter horse mom mode, because I was sure that she was broken. My trainer thought it was just a stone bruise, so we gave her some time off. After that, Casey seemed to be "sound" and looked great, but when riding her I could just feel... something... Nothing that I could truly define, but enough that I knew things were not right. After some waffling, I decided to just have the vet out for her. The way I saw it, I would be stressed until I either knew what was going on or things got better on their own (which I doubted would happen, because things had been carrying on in this matter for a couple weeks). So I had the vet out. He immediately ruled out any sort of leg lameness and ended up determining that Casey was just incredibly back sore. 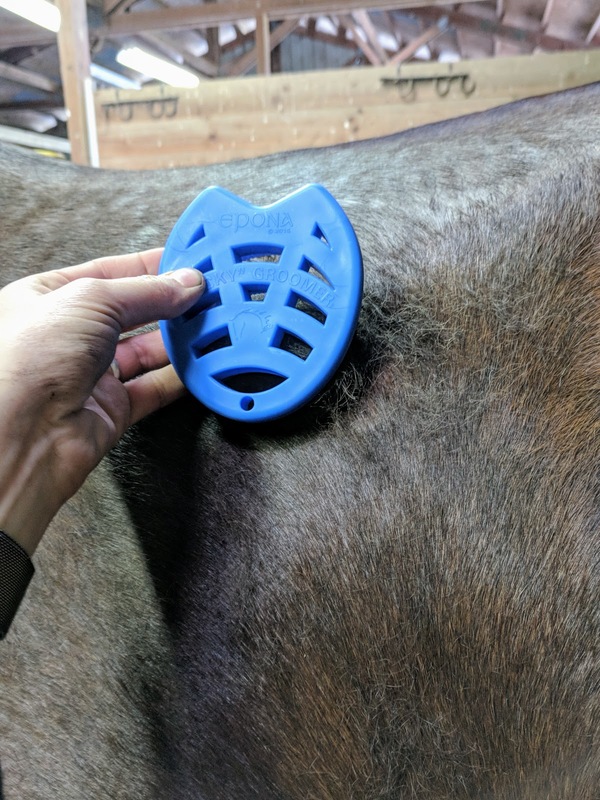 He checked her saddle fit (again) and still thought it seemed like a good fit, so he decided to do some bloodwork to see if her vitamin E or selenium levels were off (as both can cause body soreness). We then played the waiting game for the results to come back (for some reason this particular test takes a while to come back). In the meantime, I spent my time riding Olive, a lesson horse who had a bunch of time off due to a nasty cut on her hock, and just playing around with Casey. 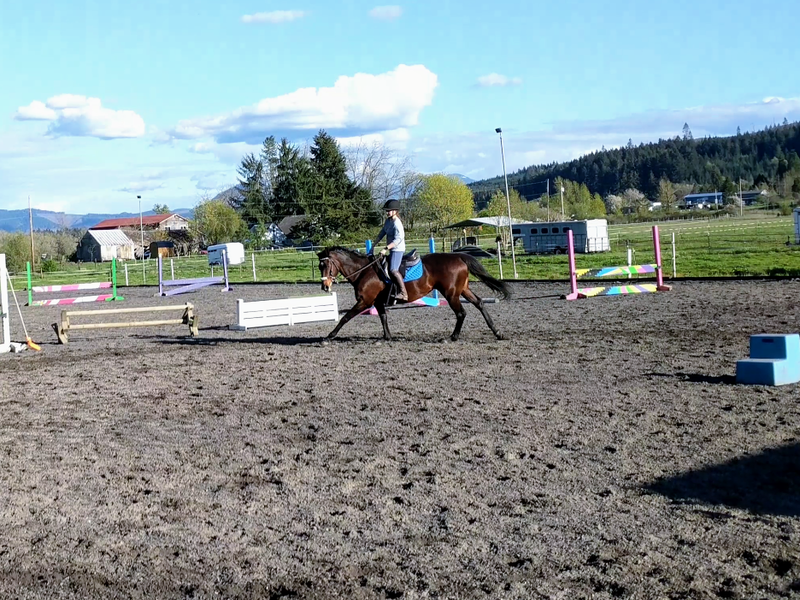 She was sound enough to be lunged, so we did a lot of lunge-work to try to keep her fitness up. After a week and a half, the results finally came back. Her selenium levels were perfect, but her vitamin E levels were super duper low. So after conferencing with the vet, he recommended that I stick her on a vitamin E supplement and thought that would make all the difference. The supplements that I ended up ordered were SmartPaks. Since I was ordering them anyways, I opted to throw in the Dark & Handsome supplement as well so that I could get free auto-shipping. I'm super excited to see the difference that the supplements make. 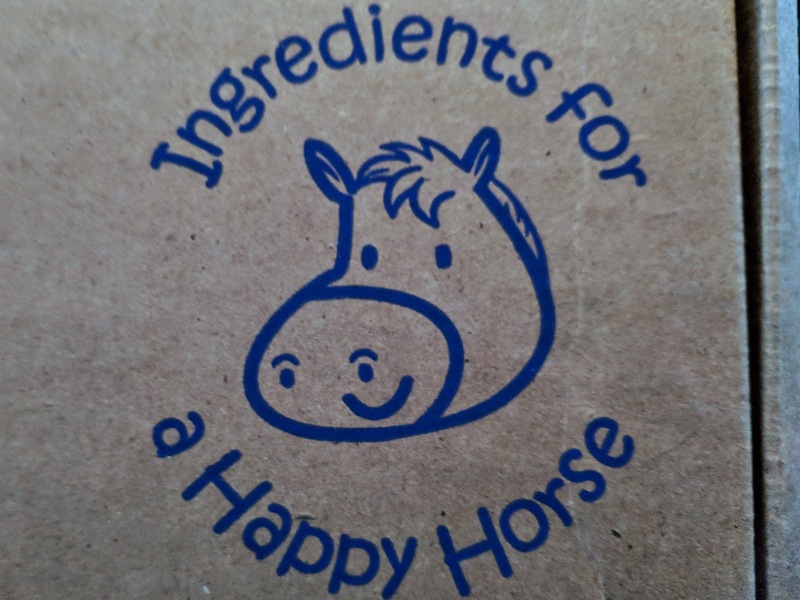 I hope that the vitamin E alleviates the back soreness entirely and I'm also hoping that the Dark & Handsome one results in a super shiny, super-dappley pony. I was a bit worried about if Casey would eat them (she's super picky & the Dark & Handsome one had some reviewers commenting on horses refusing to eat it), but I fed the horses last night, and it seemed that Casey was chowing down, so I think we're good. It looks like Casey is starting to shed out into dapples, but I want MORE! Once we knew what the problem was, I went back to riding Casey. I think that the time off did her good because she has felt great. 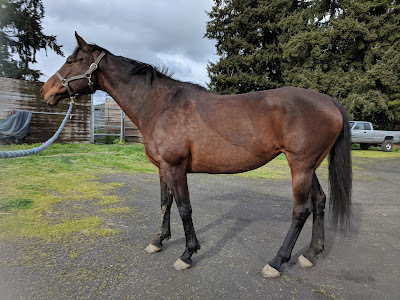 It took a while for the supplements to arrive and so I only started her on them yesterday, but even without being on them, she's been doing really wonderfully. We've just been working on flatwork, and haven't been doing super intense rides, but she feels balanced and light in the bridle. 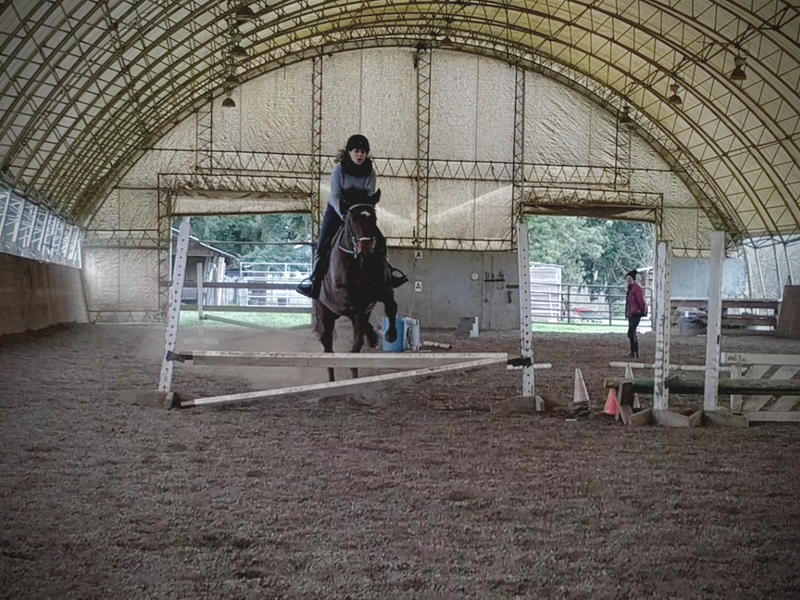 Yesterday's ride I introduced trot & canter poles back into our routine, and she was awesome. I had set the poles up as a "course" (can you tell I miss jumping?) and Casey was calm while trotting. At times I had to rebalance her a bit, but I wasn't having to hold her back. Since she was so good, I opted to try a line at the canter, and OMG she was fab! 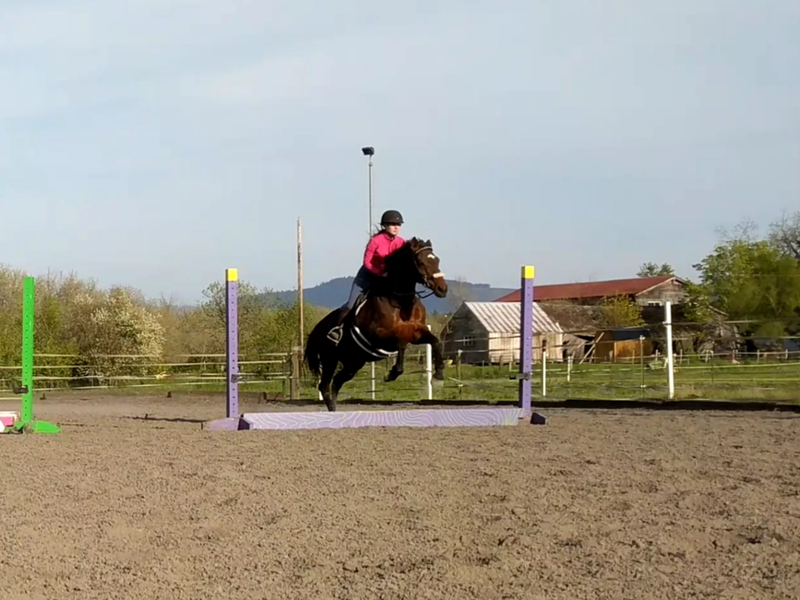 She got a tad excited at the second jump, but when I half halted she came back nicely and added the extra stride. Proud mom moment right there! Outside of horses, my life has been exciting & wonderful, but also super exhausting. 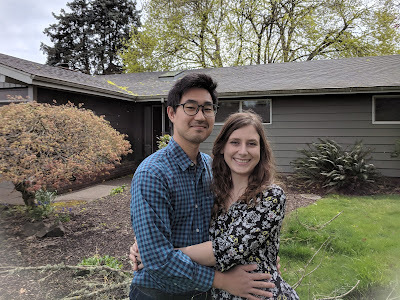 We ended up buying a house! It's in exactly the neighborhood we wanted, on a quiet street, and, best of all, we could afford it! We ended up closing right before Spring Break, and so then literally spent the whole week of vacation working on remodels. 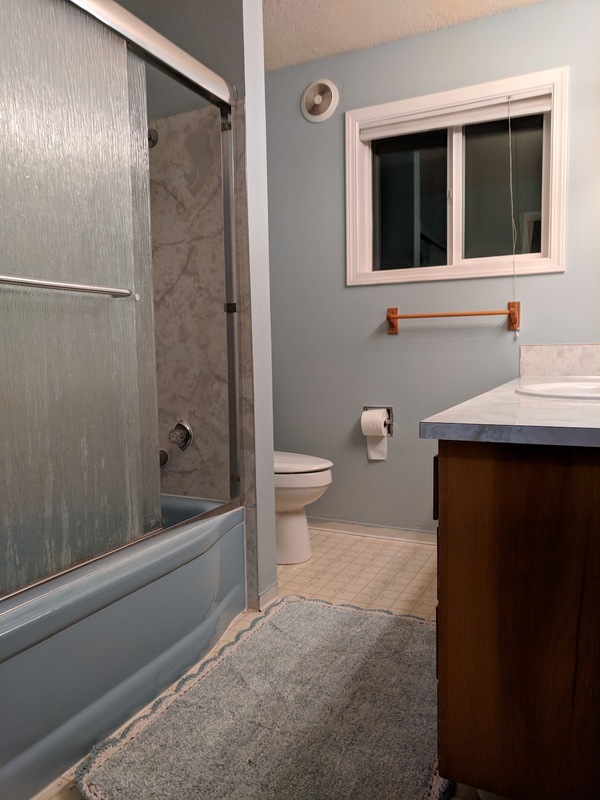 The house had really good bones, it's a solid 50's ranch style house, but the prior owner did not take the best of care of it. She smoked in the house and trashed the carpet. 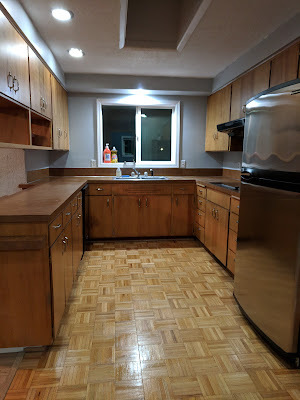 Once it was ours, we tore out the carpet & subfloor, tore out a hideous half-wall, ripped out all of the old baseboards, installed click-laminate flooring, installed new baseboards throughout the house, painted everything, and thoroughly cleaned. All of that was done with just some help from family members, no professionals involved at all. In addition to that, we also had to move everything from our rental to our new house & clean the rental. It was exhausting, but also amazing. There's nothing quite like hating something and then having the power to destroy/change it. 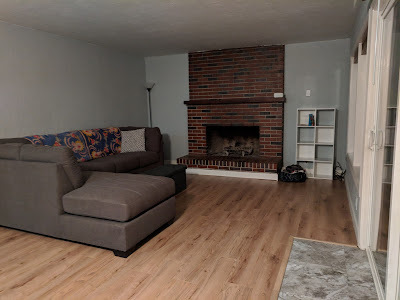 After living in rentals for most of my life it's so liberating to own a home. Now that we've finally finished the remodeling and moving process our life is starting to mellow a bit. We still have things that we want to do with the house, but for the most part, we've taken care of the major things. I'm probably going to have a lot of summer projects that I want to do, but those can wait until I'm on vacation (oh the wonders of being a teacher). 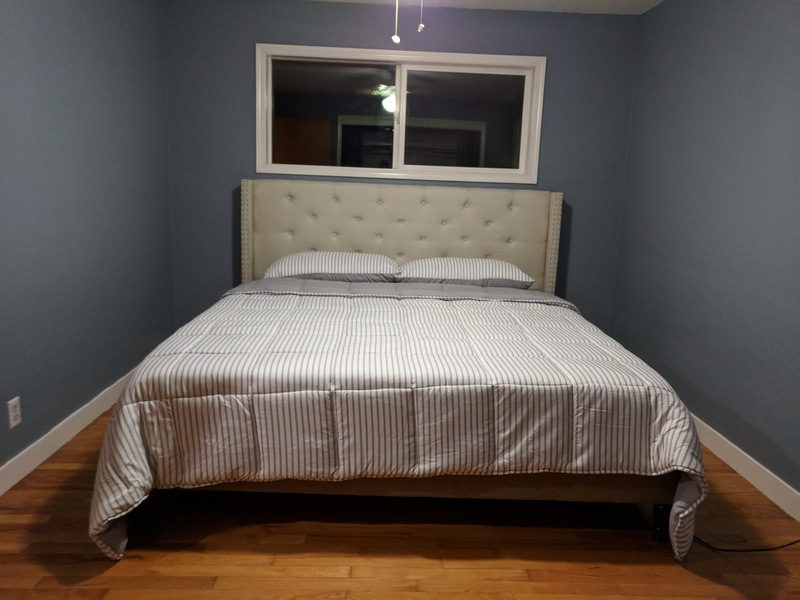 Master bedroom with our new bed - it takes up almost the whole room, but no regrets! 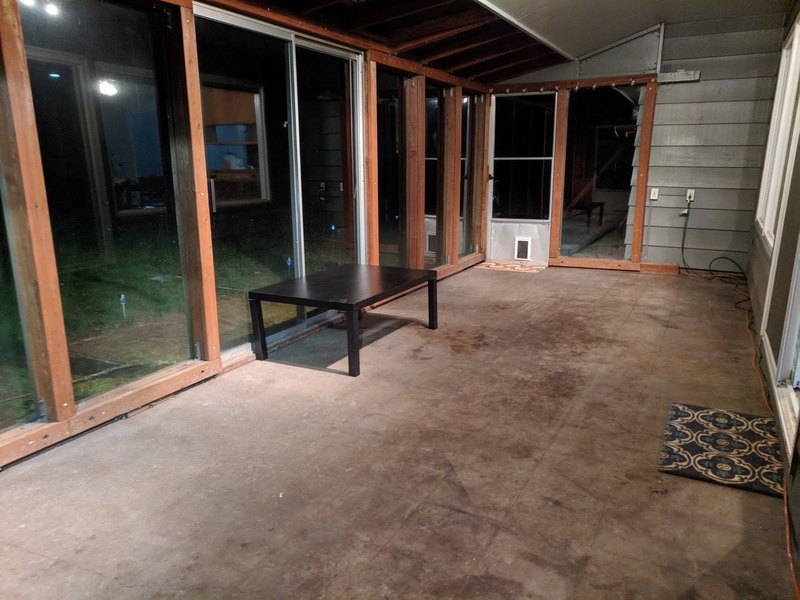 And the sunroom! I'm so excited about this. Having a sunroom was on my house wish list, but I never expected to get one! So that's my whirlwind of a life! Here's to hoping that I can go back to a normal routine! After Casey's shoe situation was resolved, I took her to the indoor arena to see if she wanted to run around a bit and be crazy, especially since she hadn't gotten exercised in two days in a row. She was being a bit of a princess (surprise, surprise...) and didn't want to do much of anything because the shoe felt weird. She was doing a bit of trotting, but was pretty unwilling to canter. I think that she just was readjusting to the weight of the shoe, because after I tacked her up and hopped on she started moving normally again. Before our lesson officially started, I warmed us both up by having Casey walk on a loose rein. I usually try to hop on 5-10 minutes before my lesson officially starts so that we have plenty of warm-up time. She was relaxed and had a nice swingy walk, but as soon as my Trainer walked up to the arena with her dogs in tow, that nice, relaxed Casey vanished. She started trying to bolt, because obviously the dog was trying to eat her. It was a whole lot of giraffe-head, wide-eyed, panicky circles. I couldn't get her to calm down while the dogs were around so Trainer ended up having to chase the dogs out. My theory is that the dogs were just today's handy excuse to try to offload all of her energy, because it is quite normal for the dogs to hang out in the arena when Trainer is teaching. Although Casey always has to give them some serious side-eye, besides that she normally is fine with them. For the flat-work portion of today's lesson, Trainer had us doing large, whole-arena, figure-eights. She placed two poles in the middle of the arena, on opposite diagonal lines so that each time Casey and I crossed the arena, we'd go over a pole. 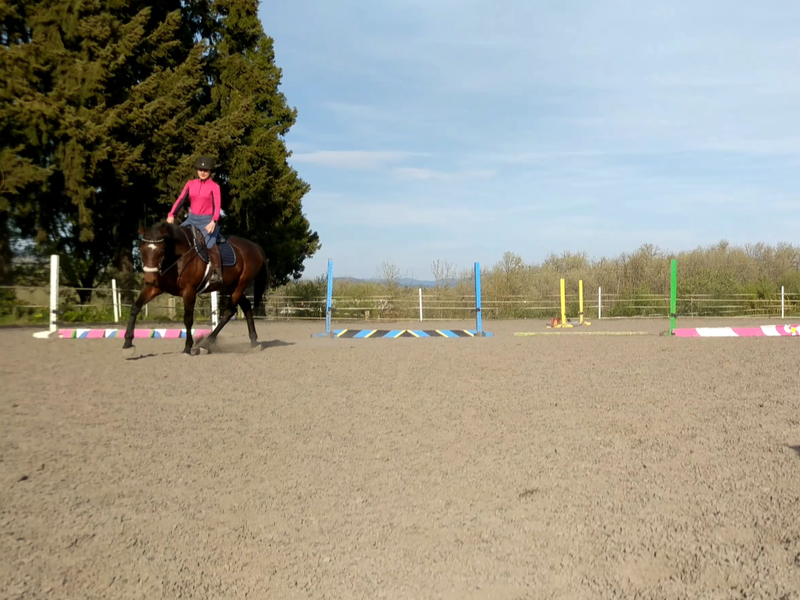 We would get a nice collected trot, maybe do a few circles at the end of the arena to get the trot really balanced, and then trot across the diagonal. Trainer always had me go down a gait when we hit the wall at the end of the diagonal (so if we trotted the pole, we would come to a walk; if we had cantered the pole, we'd come to a trot). After getting a few strides of the lower gait, we'd then pick up the bigger gait and come across the other diagonal. 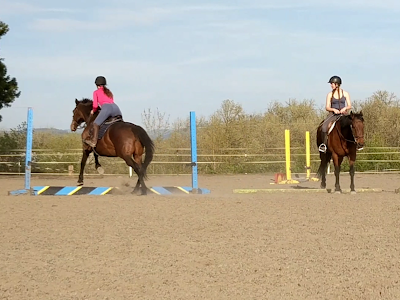 We did this at the trot at first, and then did it at the canter. Casey was getting a little bit resistant to the bit (she started bracing), but besides that was staying very well behaved, which is SHOCKING, because this exercise required lots of transitions (which normally get her hot and crazy). Once Casey was able to listen to me between the jumps, we allowed her to do the whole line through, crossrail to crossrail. 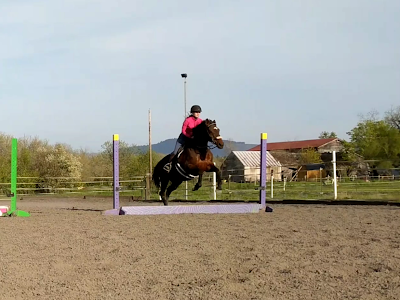 She was being pretty good, but was still a bit strong between the jumps. 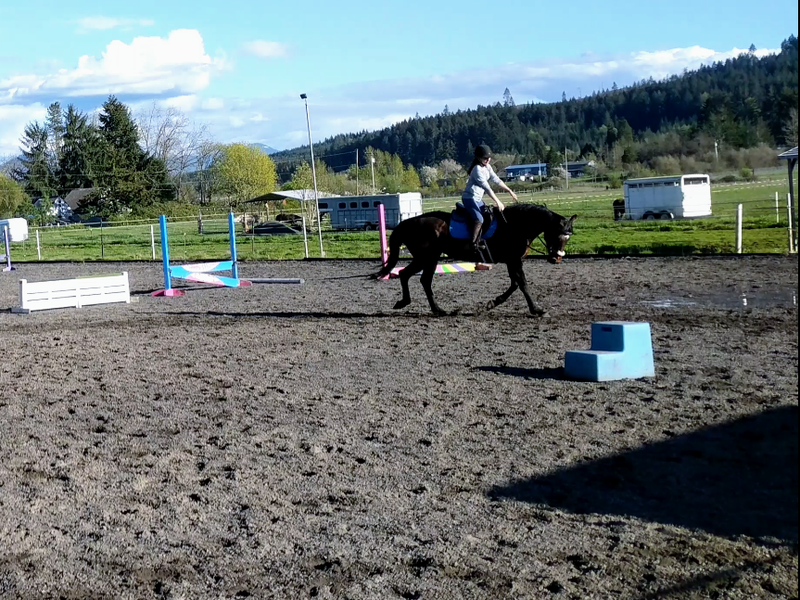 We got a bit of a flyer when I allowed her to sustain the canter to the second jump, but overall she was trying. Then Trainer raised the second jump and made it a two-foot vertical. 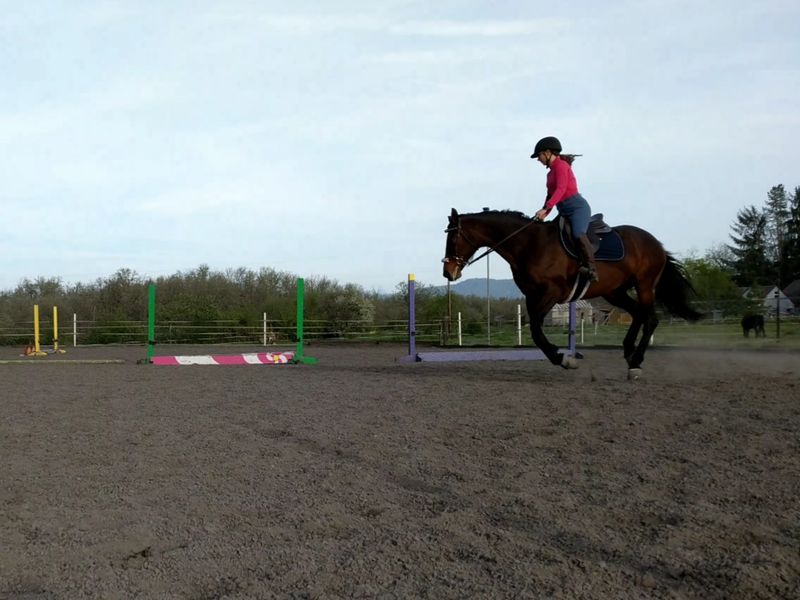 I set Casey up with a nice, balanced trot, we got a nice jump over the crossrail, Casey had a super balanced lovely canter, and then she gave the most perfect jump over the vertical. 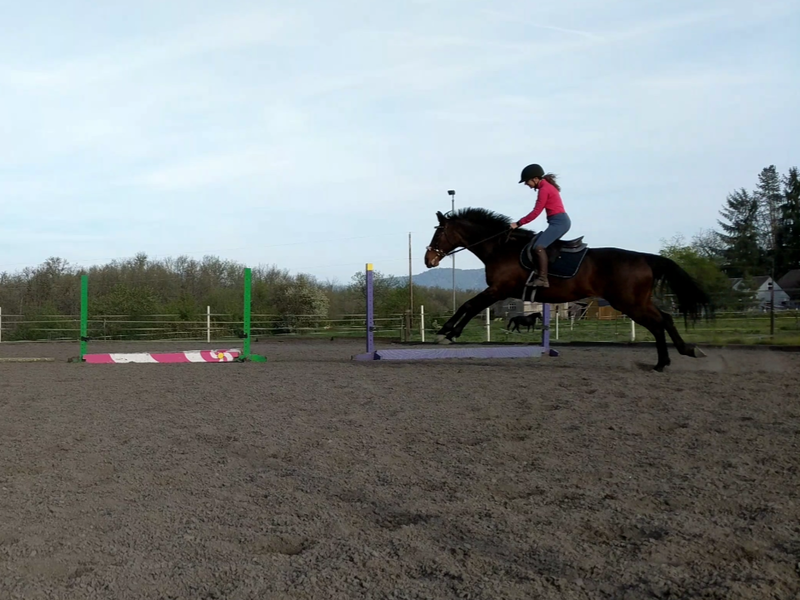 It was balanced, it was relaxed, and most importantly, she didn't speed up or get strong right before the jump! Both Trainer and I immediately started gushing over Casey, telling her how amazing she was, and with that we both decided to let her be done. It was a perfect line and we knew we wouldn't get better, so we wanted to end on that good note. We are both strong believers on ending when the horse does what you asked, rather than drilling exercises. I was super impressed with Casey today. Considering how the ride started, she improved leaps and bounds within the lesson time. 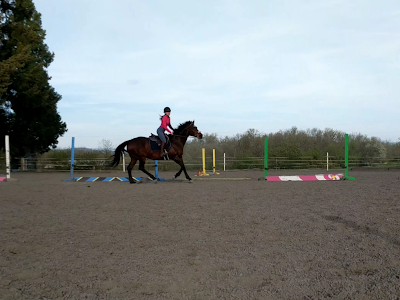 Not only did she improve within the lesson, I've also just seen huge improvement in her over the past couple of months. 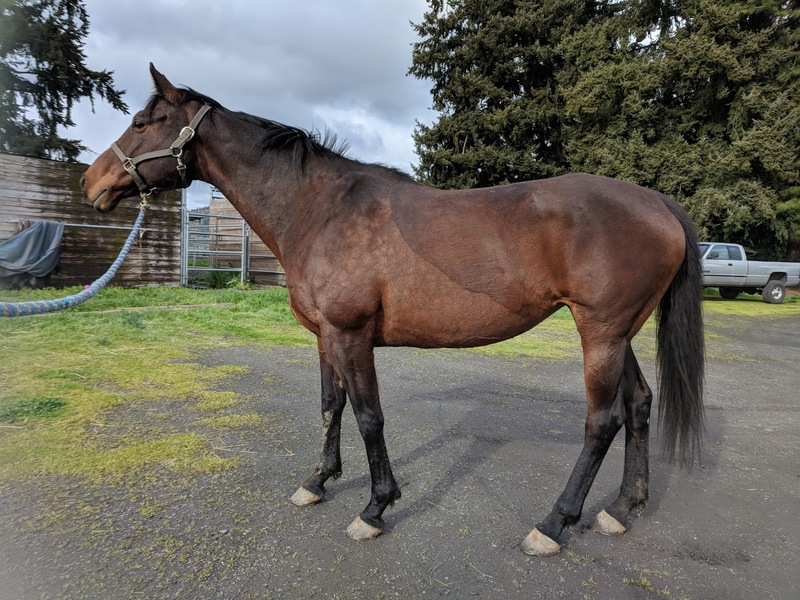 She still has that Thoroughbred brain that's missing a few screws and only ever wants to gallop, but she has been trying so hard to be good. I think she's finally figuring out what we want from her. She is becoming so fun to ride, because she is so much more adjustable & knowledgeable than even this time last year. The plan going forward is to continue working on responsiveness while jumping & adjustability on the flat. We are also still building Casey's strength. 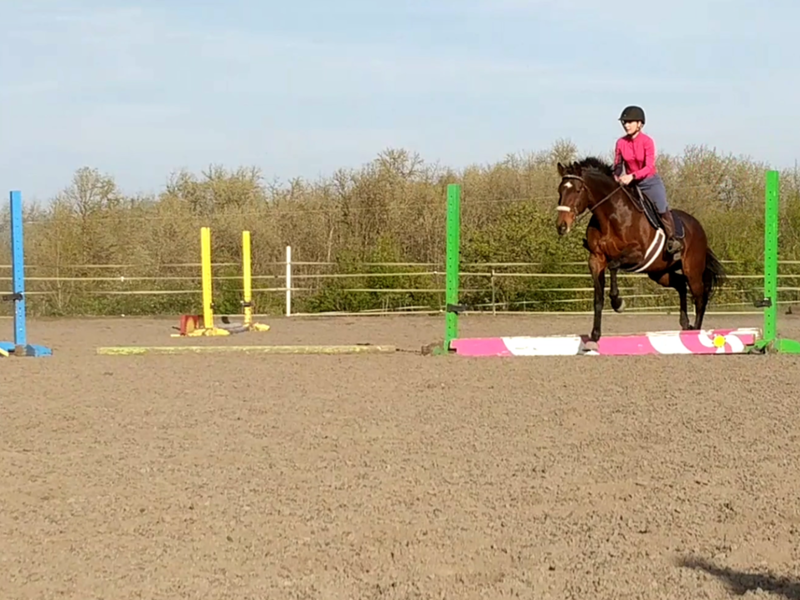 Each jump lesson we are adding in more jump attempts and also are slowing going up in jump height. Casey has felt so strong and so sound, so I bet we could increase the pace a bit, but since we aren't in a rush for anything, I feel good about taking our time. 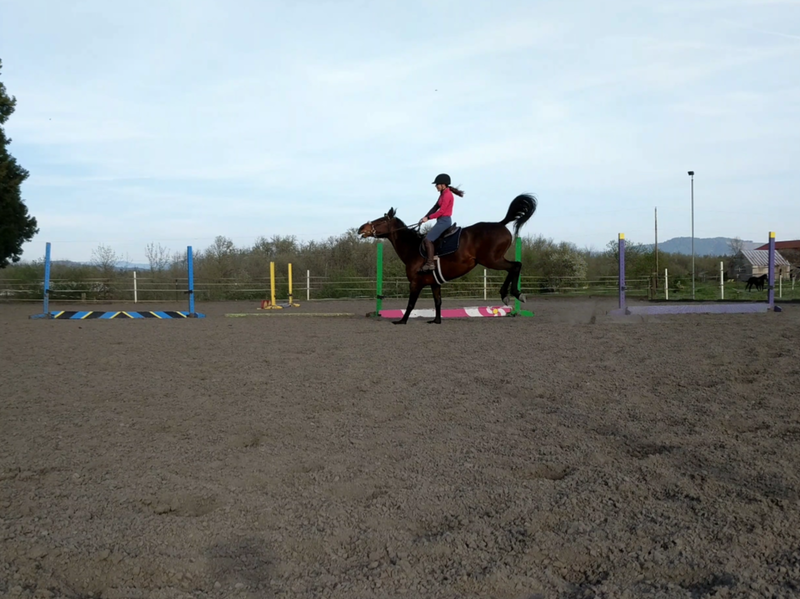 Sure it might take us a bit longer to get back to jumping three-foot jumps, but we are working on a lot of essential skills with these smaller jumps, and I'd quite frankly sell my soul to avoid rehab again. Right now I'm just so thankful that my horse is happy, sound, and being such well-behaved!